Vascular complications are the most feared complication of percutaneous renal procedures. Hematuria and perirenal hematomas, if they occur, usually arise from injury to renal arteries or its branches. Lumbar artery injury after percutaneous renal procedures is a rare occurrence. We report two cases of lumbar artery injury: one after antegrade ureteric stenting and the other after percutaneous renal biopsy. Both were successfully treated by transcatheter embolization. Percutaneous procedures are commonly needed for both diagnosis and management of numerous renal pathologies, from renal failure to obstruction to malignancies. Inadvertent injury to vessels causing bleeding is the most dreaded complication of these procedures. Bleeding can present as hematuria or as renal, perirenal, or retroperitoneal hematoma. The usual source of bleeding is injury to renal vessels or its branches. Injury has also been reported to the nonrenal vessels such as intercostal, renal capsular, and lumbar arteries. Lumbar artery injury after percutaneous procedures is very rare. We report two cases of perirenal hematoma after lumbar artery injury: one after percutaneous renal biopsy and other after antegrade ureteric stent placement. Both were successfully treated by transcatheter embolization. A 12-year-old boy with a large retroperitoneal sarcoma with bilateral obstructive uropathy was planned for bilateral ureteric stenting. His preoperative serum creatinine was raised and coagulation parameters were normal. Cystoscopy showed a deformed bladder with severe bullous edema of the trigone. Both the ureteric orifices could not be identified on cystoscopy; hence, a decision of antegrade ureteral stenting was taken. Based on the preoperative plain computed tomography (CT) scan determined landmark of the renal pelvis, a Chiba-needle puncture was made 5 cm lateral to the midline at the level of the third lumbar vertebra. Once the right pelvicalyceal system was opacified, mid calyceal puncture was made using an 18G three-part percutaneous access needle (Surgimedik Healthcare India Pvt. Ltd, Mumbai, India). Guidewire could be negotiated into the bladder, and antegrade double-J stent was placed. A similar procedure was performed on the left side. The procedure was uneventful. Postprocedure, the patient had a progressively increasing abdominal distension, right flank pain, and hypotension. Bedside ultrasonography indicated a large right perirenal hematoma. Contrast-enhanced CT scan confirmed the hematoma [Figure 1] and demonstrated active contrast leak from the right lumbar artery during the arteriography phase of the CT scan. Renal vessels appeared normal. In view of the dropping blood pressure and hemoglobin levels, a decision of angioembolization was taken. Transfemoral aortography and renal angiography were performed. Renal vasculature was normal. Selective catheterization of the second right lumbar artery confirmed the extravasation of contrast solution from the middle part of the anterior branch of lumbar artery. The bleeding vessel was embolized using polyvinyl alcohol particles (Boston Scientific Target Therapeutics, California, USA). Posttranscatheter embolization, the pain reduced and blood pressure stabilized. There was no increase in the size of hematoma over a 1-week hospitalization period. The second patient was a 45-year-old recently diagnosed patient of chronic kidney disease. An ultrasonography controlled renal biopsy was performed. Immediately after the biopsy, the patient complained of significant flank pain with hypotension. 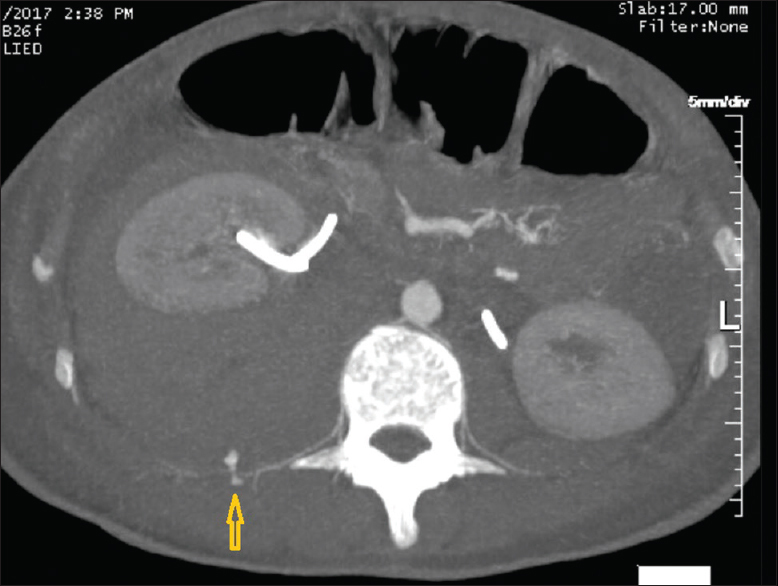 An urgent CT scan was performed that showed a large left perirenal and retroperitoneal hematoma with bleeding from the left lumbar artery [Figure 2]. Transfemoral aortography and renal angiography confirmed the renal vessels to be normal. Active bleeding was documented from the second left lumbar artery. He was also managed by an emergency transcatheter angioembolization of the lumbar artery using gelatin foam (Gelfoam, Upjohn, Kalamazoo, MI, USA). Postembolization, the hematoma stabilized, pain reduced, and blood pressure stabilized. At 3-month follow-up, ultrasonography showed a small residual hematoma. Percutaneous renal procedures are commonly performed for evaluation, diagnosis, and management of urological and nephrological diseases. The commonly performed percutaneous procedures are renal biopsy and percutaneous access to the upper urinary tract collecting system. Percutaneous access can be utilized for drainage in case of obstruction, for instillation of therapeutic agents, or for percutaneous interventions. Although percutaneous puncture is safe, there are many complications described in the literature: hemorrhage (acute and delayed); injury to the collecting system, surrounding viscera or pleura; postoperative fever and sepsis; venous thromboembolism; obstruction to collecting system; and loss of renal function and death. One of the major complications of percutaneous procedures is bleeding. The risk of bleeding requiring transfusion during percutaneous renal procedures has been reported to be 1%–12%. Recent series have reported transfusion rates to be <2.5%. The most important cause for bleeding is vascular injury, leading to arteriovenous fistulas and pseudoaneurysms. Renal vessels or their peripheral branches are the usual source of injury and bleeding. Although most bleeding can be controlled conservatively, about 0.3%–1.4% may need angioembolization. The lumbar arteries are usually paired arteries arising from the dorsal aspect of the aorta. They encircle the vertebral bodies [Figure 1] and divide into small branches to the psoas muscle and the radicular medullary artery before further dividing into anterior and posterior branches. The anterior branch supplies the quadratus lumborum and sacrospinal muscle while the posterior branch supplies the sacrospinalis and skin on the back. Both these branches run dorsal to the kidney and are thus prone to injury during percutaneous renal procedures, especially when the puncture is medial. Both these patients had a medial percutaneous puncture (for biopsy and renal pelvis opacification). There are reports of lumbar artery injury after percutaneous nephrolithotomy (PCNL). In a large series of 1854 patients who underwent PCNL, 23 needed angiography and/or embolization for bleeding control. Of these, 22 patients involved the renal vasculature and the remaining one involved the lumbar artery. One more thing to remember is that the medullary radicular (Adamkiewicz) artery which usually arises from the posterior intercostal artery, in about 19% of cases, can arise from the first or second lumbar artery. During embolization, if the embolization catheter tip is introduced into the medullary radicular (Adamkiewicz) artery, which supplies regional parts of the spinal cord, spinal ischemic damage may occur. This should be kept in mind during intravascular manipulation and embolization should be avoided directly from the lumbar artery origin. 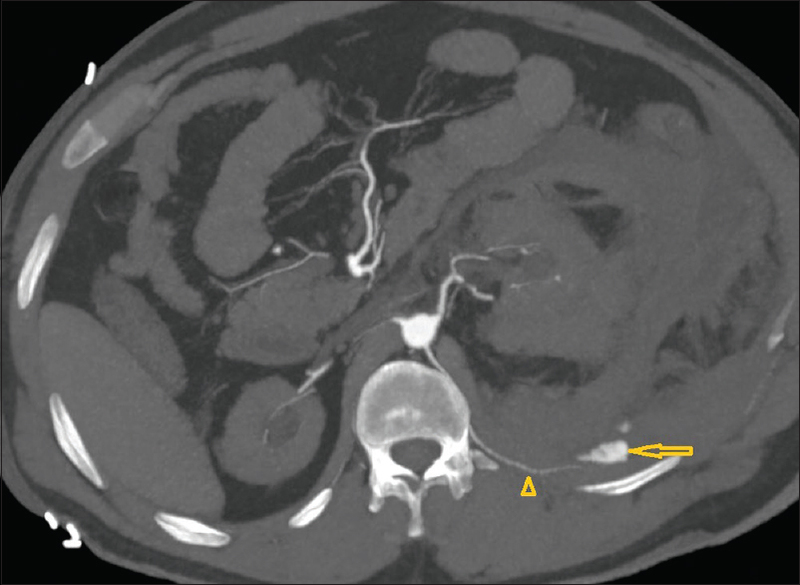 Lumbar artery injury following percutaneous renal procedures, is a rare complication. Diagnosis is best done on CT angiography. The presence of blood in the posterior pararenal space on a CT scan, medial percutaneous access, and normal renal vessels should raise suspicion of lumbar artery injury. In cases where aortography and selective renal angiogram fail to identify the source of bleeding, selective lumbar arteriography at the level of the percutaneous tract or puncture should be performed to rule out lumbar arterial injury. Whenever indicated, it can be managed by angioembolization. Lessne ML, Holly B, Huang SY, Kim CY. Diagnosis and management of hemorrhagic complications of interventional radiology procedures. Semin Intervent Radiol 2015;32:89-97. Tummala V, Nanavati KI, Yrizarry JM, Scagnelli T. Lumbar artery pseudoaneurysm following percutaneous nephrolithotripsy: Treatment by transcatheter embolization. Indian J Urol 2008;24:408-10. Seitz C, Desai M, Häcker A, Hakenberg OW, Liatsikos E, Nagele U, et al. Incidence, prevention, and management of complications following percutaneous nephrolitholapaxy. Eur Urol 2012;61:146-58. Srivastava A, Singh KJ, Suri A, Dubey D, Kumar A, Kapoor R, et al. Vascular complications after percutaneous nephrolithotomy: Are there any predictive factors? Urology 2005;66:38-40. Krejčí K, Černá M, Žamboch K, Orság J, Klíčová A, Zadražil J, et al. Late rupture of lumbar artery as an unusual complication after renal biopsy – Case report. Urol Int 2017;98:112-4.